Select from outstanding examples of Royal Albert and Aynsley fine bone china teacup and saucer sets offered exclusively on Collectics. 1 Super pretty Royal Albert long stem rose floral pattern 5.5" diameter saucer and matching teacup standing 3.0" high and 3.5" in diameter. 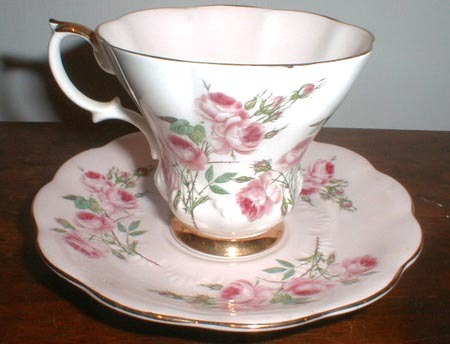 The rims of cup and saucer are trimmed in gold, and very detailed flowers decorate the surfaces of the saucer and the exterior and interior of the teacup. 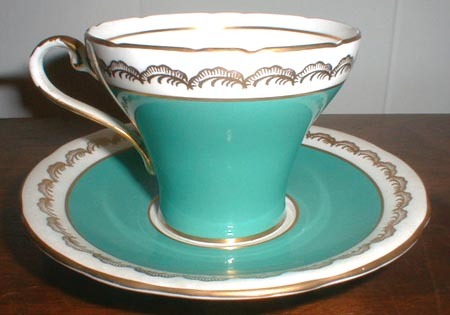 The edges are subtly curved for added effect, and both cup and saucer are in mint condition and marked with the Royal Albert crown mark, "Bone China", "England," and the pattern number. /22 2 Old John Aynsley & Sons English Staffordshire bone china teacup and saucer in a lovely shade of green and highlighted with gold trim on both cup and saucer. The edges of this pattern have subtle indentations, especially delicate on the teacup and very difficult to manufacture. The saucer measures approximately 5.5" in diameter while the cup stands 2.75" high and 3.5" in diameter. Both are in excellent condition and properly marked on the bottom with the Aynsley crown mark, "English Bone China", and the pattern number 1702.